The KX-NT700 uses a wideband speech codec to deliver high definition sound quality. This ensures that multiple users can engage in a conversation without compromising voice quality and delivers crystal clear sound giving your conferences an intimate, face-to-face feeling. A Panasonic exclusive! This ingenious feature allows you to easily understand a fast talker by slowing down spoken words while shortening the silent intervals between them. Avoids wasted time caused by asking conference participants to repeat themselves. Here’s an easy way to record and review completed meetings. The KX-NT700 features an SD card slot so you can easily record your conferences to an SD card and play them back on a PC at your convenience A 2GB SD card will record up to 67 hours of conference time! The KX-NT700 employs noise reduction technology which helps reduce ambient noise such as projector fans, ceiling music or nearby traffic so you hear the conversation, not the noise. 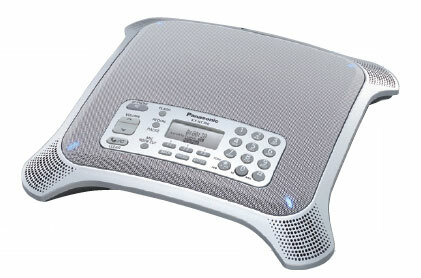 Also, the KX-NT700 supports connection to Standard (PSTN) telephone networks so it’s no problem adding a remote mobile phone to the conference if someone’s running late and you want to conference them in.